Today we're taking a break from all the Christmas celebrations to discuss an odd group of friends, a strange pole and a 'show about nothing.' And by now, all you Seinfeld fans are smiling. It's been 15 years since the TV series left the air but it's still very much around in syndication, popular culture and a little made-up holiday called Festivus. Celebrated with a bare pole and an airing of grievances, it's a time to come together and say "I got a lot of problems with you people!" It's all in good fun, of course, and in its 9 seasons, quite a lot of delicious food came up on the show. So some of my blogger friends and I decided to cook the foods best associated with the Seinfeld years and give away some great holiday gifts. The first food that came to my mind when thinking about the series was the chocolate babka. I grew up in New York and this sweet yeast bread was one of my family's favorite treats. In the episode that features it, they talk about how the cinnamon version of babka is considered inferior to the chocolate and that could have been taken straight from my childhood. As an adult, I love cinnamon pastry but I remember the disappointment we'd feel if the bakery was sold out of chocolate and we had to settle for the "inferior" cinnamon. 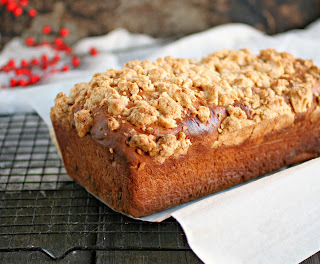 If I had any grievance against the babkas of my childhood it would be that there was never enough crumb topping and we'd all eat that first anyway. Brian is also a big lover of chocolate babka and we've bought our share of them in our years together. I'm always saying I need to learn to make it myself but it took this group Festivus celebration to finally get me to do it. It's not very complicated to make if you're comfortable working with yeast doughs but it's a giant pain without a stand mixer, which I do not have (cough, cough, hint, hint, grievance, grievance). I struggled through but, trust me, you don't want to. The final result, though, was amazing. None of the store bought babkas we've eaten throughout the years can hold a candle to homemade. And I made sure there was a whole lot of crumb topping. Enjoy! In a small bowl, add the warm milk, yeast and 1 tablespoon of the sugar. Let stand about 10 minutes until it's foaming. In the bowl of a stand mixer fitted with the paddle attachment, mix together the egg, egg yolk and remaining sugar. Add the yeast mixture and beat until incorporated. Beat in the butter. Switch to the dough hook and beat in the salt and flour. Continue kneading for about 10 minutes. Turn the dough out on a floured surface and knead by hand for a minute until smooth. Place the dough in a buttered bowl, cover in plastic wrap and place in a warm sot to rise for about an hour. The dough should double in size. In a small bowl, combine the chocolate chips, sugar and cinnamon. Punch down the risen dough and place on a floured surface. Roll out to approximately 16" square. Sprinkle the filling evenly over the dough and roll up like a jelly roll. Turn in the ends and place into a buttered and floured loaf pan. Let stand in a warm place for an additional 20 minutes to rise. While the dough is rising in the pan, pre-heat the oven to 350 degrees and make the crumb topping by combining the powdered sugar, flour, salt and melted butter in a bowl. When the dough is ready, brush the top with the cream. Crumble the topping in your hands and sprinkle over the cream. Bake for approximately 50 minutes or until the edges are barely light brown. Makes approximately 8 servings. Check out the other Seinfeld inspired goodies from my fellow bloggers below and then head down to the bottom of the post for your chance to win a slew of great prizes. Susan from The Girl In The Little Red Kitchen is making Marble Rye from "The Rye"
Kim from Cravings of a Lunatic is making Calzones from "The Calzone"
Renee from Magnolia Days is making Eggnog Frozen Yogurt from "The Non-Fat Yogurt"
Isabelle from Crumb is making Cherry Almond Muffin Tops from "The Muffin Tops"
Liz from That Skinny Chick Can Bake is making Challah Pretzels from "The Alternate Side"
Shanna from Pineapple and Coconut is making Lobster Scrambled Eggs with Wasabi Hollandaise and Crispy Leek and Potato Cakes from "The Hamptons"
Kelli from Kelli's Retro Kitchen Arts is making a Big Salad from "The Big Salad"
Kelly from Kelly Bakes is making Mulligatawny Soup from "The Soup Nazi"
Joan from Chocolate, Chocolate and More is making Cream Puffs from "The Gymnast"
Marnely from Cooking with Books is making Apple Pie from "The Pie"
Diane from Created by Diane is making Black and White Cookies from "The Dinner Party"
Anita from Hungry Couple is making Chocolate Babka from "The Dinner Party"
Giveaway is sponsored by King Arthur Flour, Lobster.com, Wilton, OXO and the collective bloggers above. There will be one winner per prize, picked by random draw and open to U.S. addresses only. 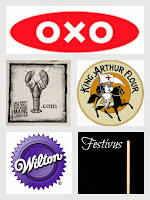 To enter, leave a comment with your Festivus grievance and then see lots more ways to enter in the Rafflecopter widget. That's it, I'm finally making babka when my family gets together in a week. It's bee on my culinary bucket list for I don't know how long. Plus you're right it's all about the crumb, mixed with the chocolate. Thanks to you I have now moved babka up on my to-bake list for 2014. The chocolate in it is what got my attention. Oh how I wish I had a slice right now. 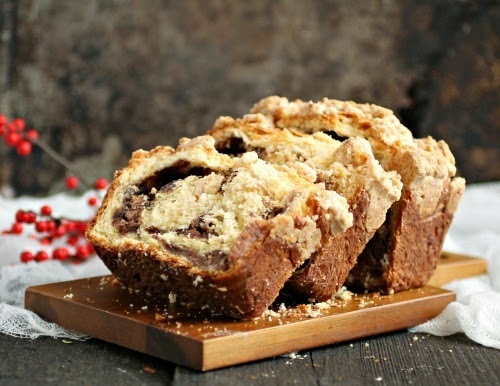 my grievance, now that I've read this is that you didn't think of your friends when making this Babka! I would have been more than happy to test it for you. Yours looks so fabulous, I know it tasted out of this world. At least that's what I image, since I didn't get any, hehe. Oh, the thick layer of crumbs is just my style! What a perfect babka, Anita!!! OH my goodness!! I adore this post!! I've always been a huge Seinfeld fan, and tired to introduce the show to my kids. As young teens, the didn't "get" it, but my son is now almost 18 and is watching the show on late night. I totally remember the babka episode, and have to admit I've never actually had Babka. I'm leaning to that cinnamon version...!!! I'm bugged that no one ever gives enough information.... like for instance when/where do the Feats of Strength begin?!? 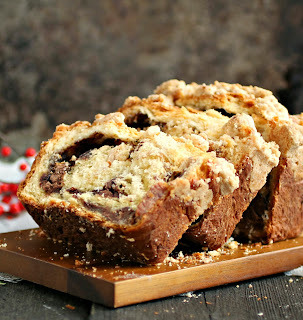 I HAVE to make this babka!! I am cracking up over the " inferior cinnamon babka". You are the queen of crumb topping. I wanted to thank you so much for helping me with this group post. I couldn't have done it without your help (Everyone's for that matter) and thank you for making the collages. 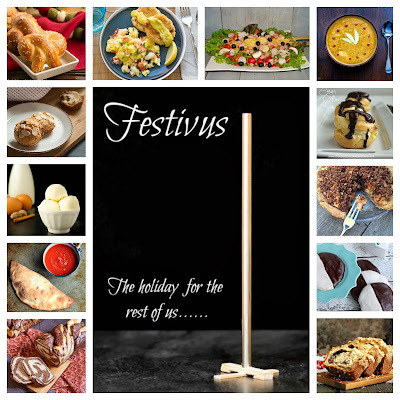 WE rocked this Festivus post!! even though I'm fairly clueless about Seinfled I do KNOW that I love chocolate babka! Yours looks like perfection! This looks and sounds fantastic. What a great giveaway and idea from a wonderful group of blogging friends. Good luck everyone--I hope I win. I'm a HUGE Seinfeld fan. Still watch in reruns and it's still as funny as it was 15+ years ago. My grievance? That there really are no sitcoms today that compare! looks like a great recipe, one question, 2 pkgs of yeast for 2 cups of flour doesn't seem right, usually it's 1 pkg of yeast for 2 to 4 cups of flour, is it a type? No, the recipe is correct. Two (1/4 oz. each) packs of yeast and two cups of flour. I tested the recipe several times and it worked each time. 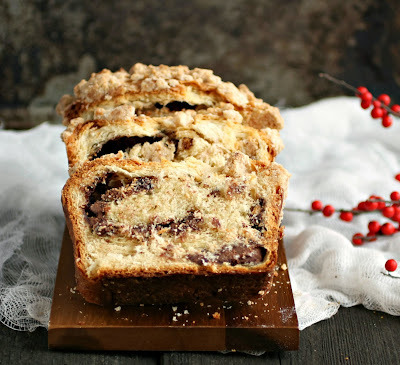 I have never been lucky enough to taste any babka and since I didn't find any in my mailbox this afternoon - I suppose you forgot about me so I'll be making my own! I can't wait because it looks wonderfully warm and chocolatey. My friend, if I thought it could survive the trip without drying out, I would happily send you your very first babka! Haha, Seinfeld is exactly what I thought of when I read your title. This bread looks amazing! 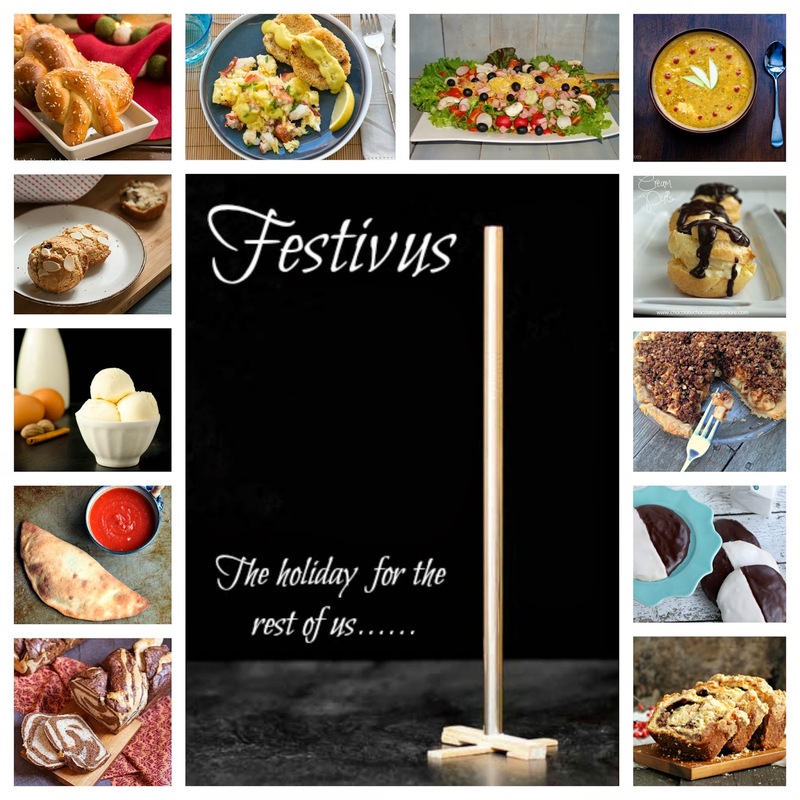 Gotta love us some Festivus, as we were there when Jerry and the Gang were at the originl holiday hoedown....they just don't make 'em like they used to, but thank goodness for reruns. Thanks for the laugh with today's blog and what a great giveaway! My current grievance is people who whistle while shopping. Babka is not something I grew up with so that's my first grievance. Who knew you could put a crumb topping on yeast bread?! That's a revelation to me. 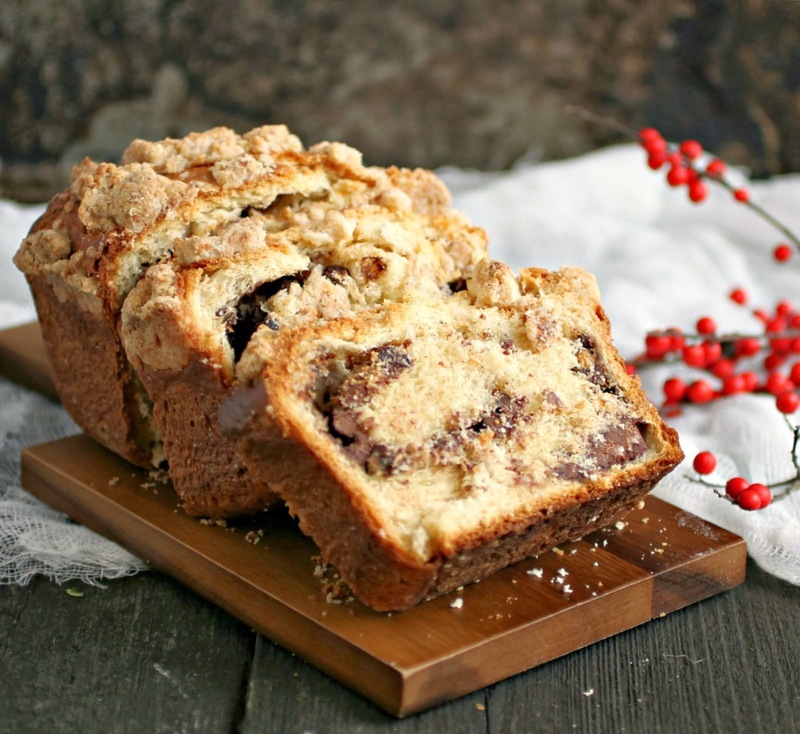 Babka, where have you been all my life? My current grievance is with Verizon Wireless (I know I've shocked you with this one). They just sent me a 35-cent check in the mail as compensation for overcharging me while I was their customer. Really? How about sending me a check to make up for the job they put us out of?? These look great plus easy - the perfect combination! I love Ina's recipes too.